Painful knees should not be considered a sign of dedication, but rather as a warning that you are doing something wrong. It doesn’t matter what sports you are in, knee injuries and incorrect movements go together. Squats can cause knee pain, but so can walking or running if your movement patterns are being compensated due to poor body posture and muscle imbalances. Read these five tips to avoid any kind of knee pain or even injury! The biggest challenge every coach will be facing is finding the optimal amount of physical stress that the athletes can handle and benefit from, without breaking down due to overstrain. It is a difficult task and also hard to evaluate – almost impossible if you are your own coach. Sooner or later, many athletes will experience practicing “junk kilos and junk reps”. These are the weights and repetitions you don’t benefit from. Instead, they cause additional stress which can severely harm your joints, ligaments and muscles. Your knees are no exception. Pain develops slowly over time without revealing any obvious red flags along the way. The reason for this is the repeated movements coupled with volume or weight that causes more stress than your joints are able to recover from. The necessary precautions to take are: a good training plan, technique fix, anatomically fitted knee support and exercises to strengthen the weak parts of your body that may cause imbalances in your movements. If the pain is already there you recover by rest, contrast bath therapy (heat/ice theraphy) and rehabilitation exercises. Strength exercises have gotten a bad reputation caused by the people that are doing them wrong. However, they are not bad for you by definition, but demand that you know what you are doing. For example, athletes like Olympic weightlifers have learned the proper technique, drilled it over and over again in order to strengthen certain positions to gain control of each lift. Anyone lifting too heavy weights can get in trouble in the event of unpredictable, sudden twists or falls that lead to knee injuries such as sprains, strains, torn ligaments or tendons, dislocation of the knee cap and torn meniscus, etc. In order to be in control and be able to lift more, first, ask for help and get your squats and other weightlifting movements checked. While doing this, focus on your posture. How is your pelvis moving during the lift? How curved does your spine get? How do you position your knees? Do you need to work on your agility? Do you know how to stabilize your spine? After that is done, start practising your exercises with lower weights and progress gradually until your movements become controlled. The closer you get to your PR numbers, the more vulnerable your knees will get. Many athletes turn to knee support in order to add stability, warmth and compression to their joints. The knee support will create a feeling of safety as well as actually preventing injuries. 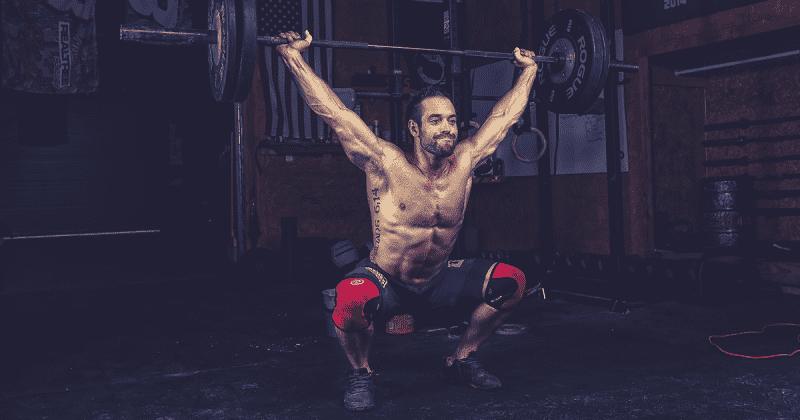 For example the four-time Fittest Man on Earth, Rich Froning, says he simply feels better squatting with knee sleeves on. With high volume, time pressure and competitiveness, CrossFit workouts often push you further than your body will be prepared of. The sense of control decreases and your body, especially joints, become vulnerable for injuries. Therefore athletes of all levels tend to seek insurances of stability and warmth in knee sleeves. It is a wise choice for the athletes that want to be able to push themselves, build muscles and learn the techniques in the same time as they keep themselves injury free. As last year’s CrossFit Games winner Camille Leblanc-Bazinet says, knee sleeves make her feel safe during the heavier lifts and demanding workouts. However, we all know that there is a big difference between knee sleeves. Johan Bohlin, physiotherapist since 13 years and product developer at the sport support brand Rehband, explains: “Our knee sleeves has a patented anatomic fit that follow the full range of motion and stabilize in the sense of guiding your body in moving correctly without limiting any parts of the workout.” The anatomical shape is something we know many professional athletes prefer. Rich Froning says “I have been using Rehband knee sleeves during my whole career, they are the best in quality and design and I love them”. When was the last time you practised to enhance your balance? Proprioception is a subconscious system that keeps you safe by balancing your body. It can be explained as the ability to sense how your body is positioned, balanced and how it moves. Your brain acts on the information it receives from the receptors positioned in muscles, ligaments and joints. Based on the tension and the stretch that those receptors sense, the brain reacts either with contracting or stretching the affected muscle to make appropriate adjustment to the movement. Combining a good proprioceptive ability with body awareness, might save you when the accident occur. Your body could be trained to act spontaneously and adjust its movement correctly to save you from injury. This is the reason why you will see many athletes practice standing on balance boards, doing exercises on balls and many other proprioceptive workouts. Stretching as injury prevention has been a hot topic with contradictory findings for the past few years. While some experts say it might be beneficial, others suggest it has no effect at all. What we do know is that regular causes of knee pain are stiff muscles around hips, tights and lower back. Most of us are not professional athletes, but instead full-time office workers. This means we spend at least 7 to 8 hours per working day sitting, while adjusting our joints and muscles to an inactive lifestyle. By the time you arrive to the gym your whole body feels stiff – and it is. Make sure to turn this feeling around and start your workout with a good feeling in your body. Start with releasing the tension by simply adding a few minutes of stretching to your warm-up routine. If you feel it relaxes you too much, throw in a few air squat jumps to activate and prepare your body for the great workout ahead. Before worrying about all the stress that Olympic weightlifting, Powerlifting, CrossFit and other similar sports will put your body through, remember that these activities have lower injury rates compared to other disciplines. This is due to the fact that every part of the movements can be controlled. Keep in mind that injury prevention starts with your attitude.